HKRAS Herp Adoption Program is a non-profit, Hong Kong-based program dedicated to finding herps and other animals the best possible home. We understand that it is much more difficult to find a new home for herps than for cats and dogs. Many people have no solution for when they can no longer keep their herps. We are working save herps before they get abandoned by finding a home for them. And, this is a lifetime mission. Herps only? What animals do we help? We occasionally deal with some lesser-known animals. Ask us even if your animal is not listed above. 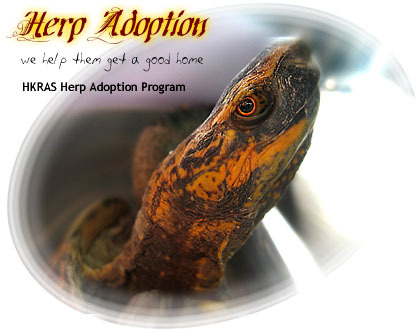 If you are sure you are capable of keeping a herp that you like, don't hesitate to fill out the Adoption application form. Since this program is not funded by any organization or group, all expense (including maintenance and vet bills) would have to be covered by donations and adoption fees. Other than money donation, used equipment and products (cages, heat lamps, dry food, etc) are also helpful to keeping the herps.